PMC has been repairing and performing modifications to pressure vessels and tanks for over 10+ years and holds ASME “U” and “S” Stamps and “R” certification from NBIB. Our expertise includes the repair and fabrication of high-pressure, low-pressure, cooling, heating or secondary containment vessels. We are experienced in carbon steel, stainless steel and various high alloy metal fabrications. 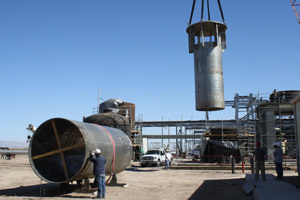 PMC completed field fabrication of a 17’ and 19’ diameter Pressure Crystallizers for Geothermal Brine separation process. Both vessels were constructed of carbon steel SA-516-70-N with Incoloy 825 lining. The internals and draft tubes were fabricated using 2205 duplex stainless steel and Inconel 625 cladding. In addition, PMC has modified and repaired various pressure vessels throughout our numerous shutdown and maintenance activities. PMC can fabricate and construct both ASME code and non-code pressure vessels and process tanks to meet your exact product specifications.